Are you worried that your discharge line might freeze over when the temperatures drop? Advanced Basement Systems can help prevent wintertime freeze-up of discharge lines. If you live in the Southwestern Ontario area where the discharge line from your sump pump is susceptible to freezing in the winter, consider installing our anti-freeze device called IceGuard. It will allow discharged water to escape if the drain freezes (or clogs for any reason). Don't let your basement flood this winter from a frozen discharge line! 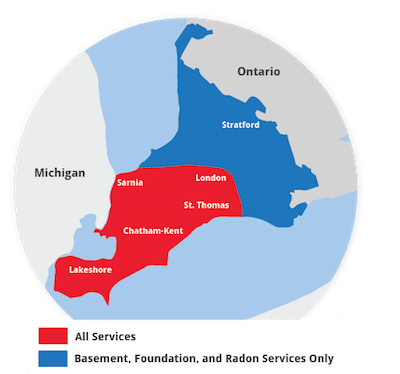 We provide our waterproofing products to homeowners all throughout Southwestern Ontario, including London, Windsor, Chatham, Sarnia and cities nearby. Contact Advanced Basement Systems today for a free cost estimate to have the IceGuard® anti-freeze discharge device installed in your home today.